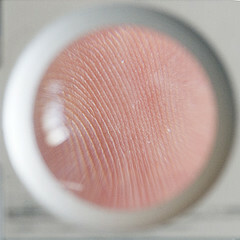 A livescan device is a specialized electronic scanner that typically attaches to a computer (desktop or a laptop). These devices allow the person collecting the prints to capture the print directly as a digital image. Typically, the device has some software that will run the print through some quality checks before accepting the image. But how do these devices work? I’m going to do my best to not get too technical here, but if I do, feel free to ask any questions in the comments below. Much like your teachers said in school, you probably aren’t the only one with questions, so don’t hold back. If a comment is too public, feel free to shoot me an e-mail, and I’ll do my best to address your concerns. Livescan devices typically will work by collecting and digitizing the residual left behind by a finger being placed on a glass platen. This is residual is no different than what is left on your iPhone screen after you have gotten done with a particularly furious round of Angry Birds or Plants Vs. Zombies. This residual is something that your fingers leave behind on almost anything you touch, and livescan machines work on taking this residual and digitizing it. That process is completed using a bunch of mirrors and software that can capture the image just like if the finger was covered in ink. This allows for prints to be captured and graded fairly quickly without needing to make the owner of the collected prints appear as if he or she just got released from the local county jail. Although livescan devices have been around for a while, only in the last decade have they have started to come into their own. Most technology, except for maybe the television in your home, has gotten physically smaller and less expensive, and livescan devices have started going the same way. I started working with livescan devices just after 9/11, and these devices were portable but only came with a few hundred horsepower, a trailer, and people to load them on a trailer. The machines were massive, with many being about the size of a hatchback car and costing as much as a luxury vehicle. That may be a slight exaggeration, but it isn’t as much as you would think or hope. These days, these machines have “hit the gym,” so-to-speak and slimmed down considerably. No longer do they require an entire team of people to move them; they are about as big as a box of Chinese take-out and weigh about the same as an order of chicken chow mein! Prices have gone from luxury vehicle territory to below $3,000. This has aided their popularity considerably, and now these sleek machines are starting to take flight and grow in popularity. Livescan is the up-and-coming star here, but ink and scanners have been the industry standard for a very long time. This was once just the ink cards that went through a chemical curing process (we call it baking the cards) and were then mailed to their adjudicator. The adjudicator would then do what he or she needed to do to obtain a result. This once involved the very laborious process of individually checking the card against a bunch of known criminals prints. As the digital age took over though, this became a computerized process, which has helped speed the process considerably. The cards are still chemically cured, but now, the collector of the prints will scan them in, digitizing them for the adjudicator and speeding up the process even further. For the General Aviation industry, we are required to use the FBI fingerprint cards and an FBI- certified flatbed scanner. The prints then get digitized and prepared to be sent to the adjudicator. However, this process is only for those who use a TSA approved collector. Those who use law enforcement still need to use U.S. mail. Once the prints arrive at their destination, extra time must be spent to digitize the cards then create the required electronic records that go along with those cards. This slows the process some, but not as much as having to do everything completely by hand. This isn’t the best process in the world. Ink isn’t as pretty or cool as livescan, but it is used by the majority of contractors as their primary means of collecting. Most collectors are extremely comfortable with this medium of work. Others are held back by the expenses of livescan. This is the question I get most often from someone who is either looking to become a collector or have their prints taken. As far as getting your prints taken, whether for a criminal history records check (CHRC) or for the Alien Flight Student Program (AFSP), how the prints are taken doesn’t matter much. If you are using local law, it will have to be the slower medium with the slower turnaround time mentioned previously. The prints will have to be taken with ink and then mailed via U.S. post. If you are using one of our collectors, it won’t matter if it is livescan or the ink and scanner. With the scanners, we are able to get those prints to the adjudicator as quickly as a livescan device. I am personally faster at taking prints with ink and cards, but others on this blog who are certified to collect prints prefer the livescan devices. A good collector can take proper prints with either device so it won’t matter with which method your prints are collected. If you are looking to become a collector, I would say that the livescan device is the best way to go, if you can afford it. It is compact and convenient for both you and the customer. However, if you can’t afford it, the standard ink and cards are great options as well. It isn’t as high tech, but it still gets the job done. Hopefully, you now have a better understanding of what I mean when I refer to these two mediums of print collection. In the end, remember that the collector is the second greatest factor of print quality only to the fingers from which you are obtaining the prints.